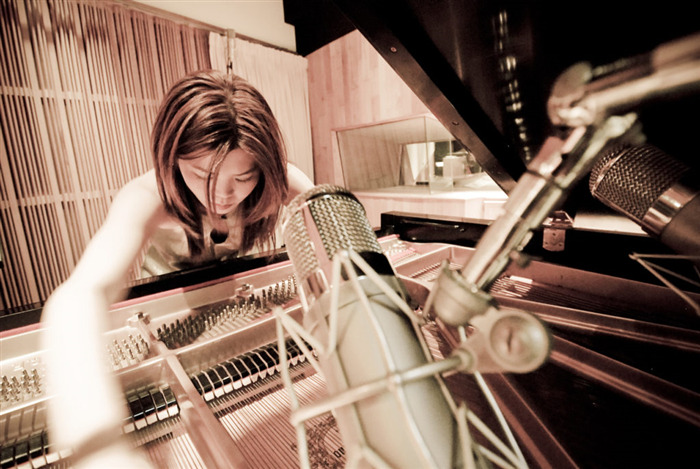 Pianist, composer, and improviser Motoko Honda is a musical force of nature who blends jazz with chamber music, electronic music, and sounds of music from around the globe. Long a vital part of the improvised music community, Honda has collaborated with many luminaries, like Wadada Leo Smith, Elliott Sharp, William Winant, Mike Watt, and others. The “keyboard alchemist” (Los Angeles Times) leads her quartet through intricate compositions that layer taut rhythms and lush melodies. The band features some of Northern California’s most inventive, versatile sidemen, including Cory Wright on woodwinds, Miles Wick on acoustic bass, and Jordan Glenn on drums. Reeds player Cory Wright has been involved in the jazz and creative music worlds for the past 25 years, including time spent in New York, Los Angeles and his current home in the San Francisco Bay Area. Recent projects reflect his interest in blurring the distinction between composed and improvised music, and in combining the harmonious with the atonal, the grooving with the arrhythmic. He has performed with Anthony Braxton, Yusef Lateef, and Vinny Golia, and is a member of Bristle, the Nathan Clevenger Group, and Goggle (saxophone quartet). He also leads his own projects Green Mitchell and the Cory Wright Outfit. Miles Wick is a bassist, singer, and songwriter with ties to New York City and San Francisco. His vast contributions to the Bay Area scene include work with the area’s most innovative jazz musicians, poets, composers, and rock musicians. Wick’s first full length album, So Much Love, is a collection of original songs accompanied on guitar. Jordan Glenn has worked closely with Fred Frith, William Winant, Zeena Parkins, Todd Sickafoose, John Schott, Dominique Leone, and bands Jack O’ The Clock, Beep!, and tUnE-yArDs. Recently, he has worked with Rhys Chatham, Secret Chiefs 3, The Rova Sax Quartet, and composer Matthew Welch. He also leads the trio Wiener Kids.